This set of Deliverables (#5) has three parts, with different deadlines. For this Looking Outwards report (as previously discussed), you are asked to identify and discuss a project which presents a specific form of interactivity that you find interesting. Full details for this deliverable can be found here. There are many different creative coding toolkits -- far more than can be learned in a single semester. Still, it's extremely helpful to be aware of what's out there. For this task, you are asked to spend 15 minutes browsing the example projects for Three.js, a code library by Ricardo Cabello which is widely used around the world for 'spectacular' 3D graphics in the browser. I recommend you check out at least a dozen examples, preferably more. There is no deliverable, but please complete this Part by October 5. 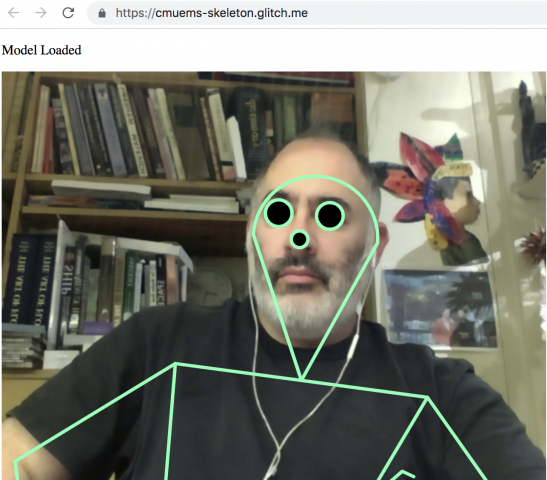 For this project, you are asked to write software which creatively interprets (or responds to) the actions of the body, as observed by a camera. You are asked to develop a computational treatment for motion-capture data captured from a person's body. You may create an ANIMATION (by using pre-recorded motion capture data), or you may create an INTERACTION (by using real-time motion capture information). Template code is provided for both scenarios, below. The following ten suggestions, which are by no means comprehensive, are intended to prompt you to appreciate the breadth of the conceptual space you may explore. In all cases, be prepared to justify your decisions. You may work in real-time (interactive), or off-line (animation). You may choose to develop a piece of interactive real-time software (as in Setsuyakurotaki, by Zach Lieberman + Rhizomatiks, shown below). Or you may choose to develop a piece of custom animation software, which interprets the motion capture file as an input to a rendering process (as in Universal Everything's Walking City). You may focus on just part of the body. Your software doesn't need to respond to the entire body; it could focus on interpreting the movements of a single part of the body (as in Theo Watson & Emily Gobeille's prototype for Puppet Parade, which responds to a single arm). 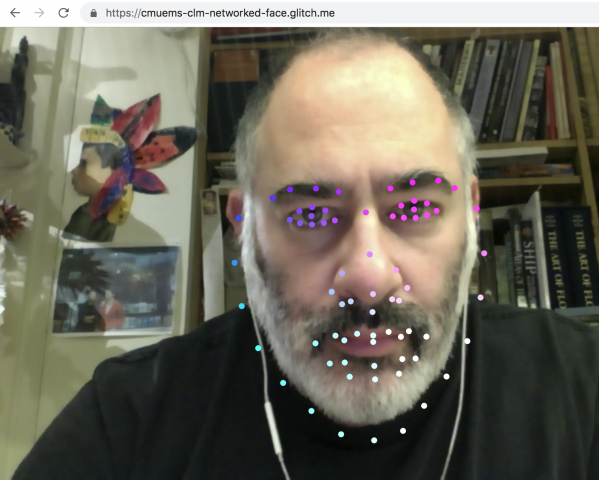 Some of the provided templates (PoseNet, BVH) provide information about the full body, while others (FaceOSC, clmTracker) provide information about the face. You may focus on how an environment is affected by a body. Your software doesn't have to re-skin or visualize the body. Instead, you can develop an environment that is affected by the movements of the body (as in Theo & Emily's Weather Worlds). You may control the behavior of something non-human. Just because your data was captured from a human, doesn't mean you must control a human. Consider using your data to puppeteer an animal, monster, plant, or even a non-living object (as in this research on "animating non-humanoid characters with human motion data" from Disney Research). You may record motion capture data yourself, or you can use data from an online source. If you're recording the data yourself, feel free to record a friend who is a performer -- perhaps a musician, actor, or athlete. Alternatively, feel free to use data from an online archive or commercial vendor, such as mocapdata.com, ACCAD, CMU Graphics Lab, etc. You may make software which is analytic or expressive. You are asked to make a piece of software which interprets the actions of the human body. While some of your peers may choose to develop a character animation or interactive software mirror, you might instead elect to create "information visualization" software that presents an ergonometric analysis of the body's joints over time. Your software could present comparisons different people making similar movements, or could track the accelerations of movements by a violinist. You could create quantitative comparisons of people's different gaits. We have purchased a copy of Brekel Pro Body v2 for you to use to record motion capture files, and we have installed it on a PC ("Veggie Dumpling") in the STUDIO; it can record Kinectv2 motion capture data into BVH and other formats. Make an arrangement with Golan or Char to make a recording. If you use pre-recorded mocap data, then ideally, the visual treatment should be designed for specific motion-capture data, and the motion-capture data should be intentionally selected (or performed) for your specific visual treatment. As an alternative, you can develop a creative software augmentation to a pre-recorded video, using this template combinding p5.js, ml5.js, and PoseNet. An example is shown below. Here is the checklist of expected components for this assignment. Sketch first! Draw some ideas. Study people moving. Develop a program that creatively interprets, or responds to, a human body. Create a blog post on this site to document your project and contain the media below. Title your blog post, nickname-Body, and give your blog post the WordPress Category, 05-Body. Write a narrative of 150-200 words describing your development process, and evaluating your results. Discuss the relationship between your specific motion file, and your treatment. Which came first? Embed a screen-grabbed video of your software running. Embed an animated GIF (or two) of your software. Embed a still image of your software. Embed some photos or scans of your notebook sketches. Embed your code attractively in the post. Test your blog post to make sure that all of the above embedded media appear correctly. Remember, if you're having a problem, ask for help! Face Pinball: Use your face to play our new pinball-inspired game!